Herb Robert grows all round our area – it could be called The Highbury Herb. 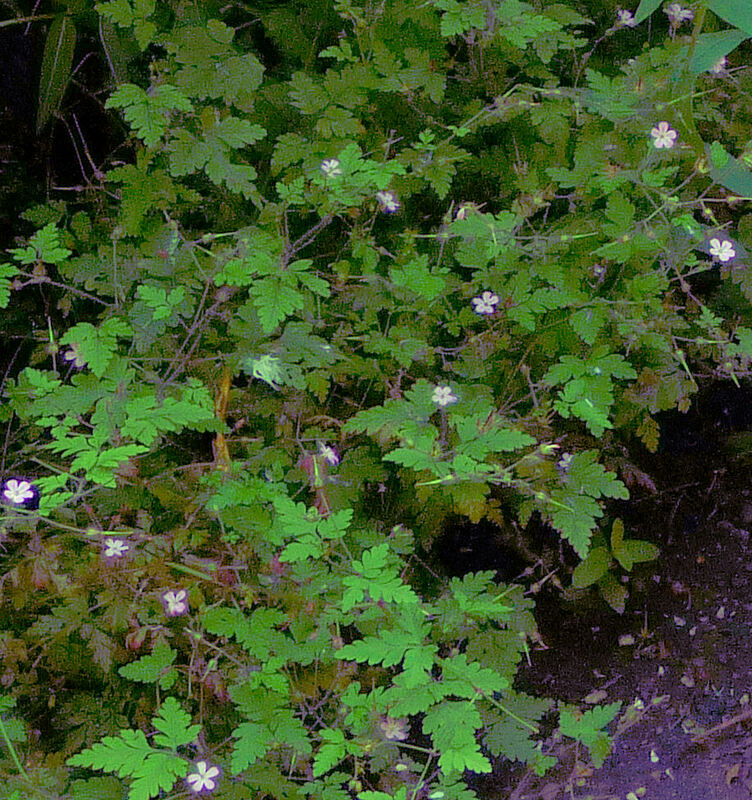 The small PINK flowers of this wild Geranium are set in delicate green foliage that turns rusty red in dry weather. 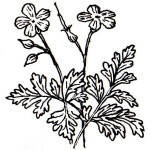 Geranium Robertianum is thought to have been named for the 11thC French saint, Abbot Robert of Molerne. 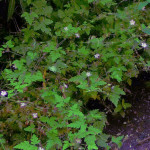 It is the food plant of bees, long-tongued hoverflies and the Barred Carpet Moth. 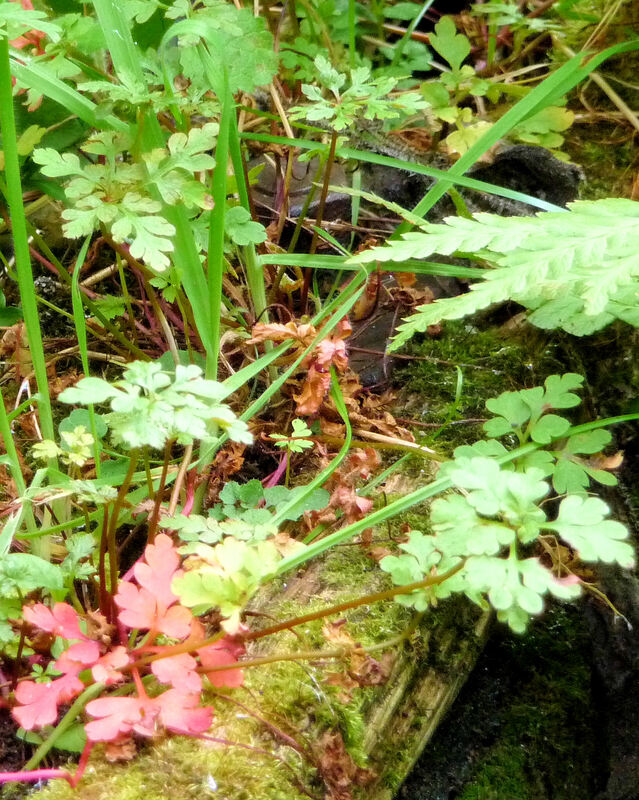 A number of insects pollinate it, but if none are available it can pollinate itself. When its seedpods split, seeds are flung out with great force. 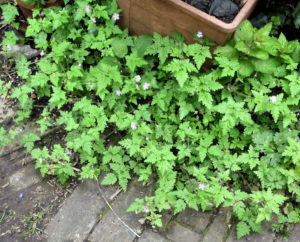 Later, new plants spring up everywhere – in shade, damp soil, cracks in concrete, gaps between paving stones. Untroubled itself by pests and diseases, this wildflower’s healing effects are felt by plants growing nearby. 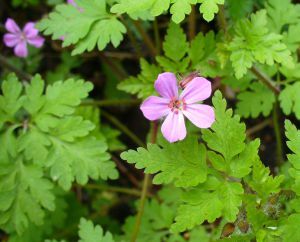 It was used in animal bedding, its leaves made into tea to boost the body’s immune system or rubbed on the skin to repel insects. 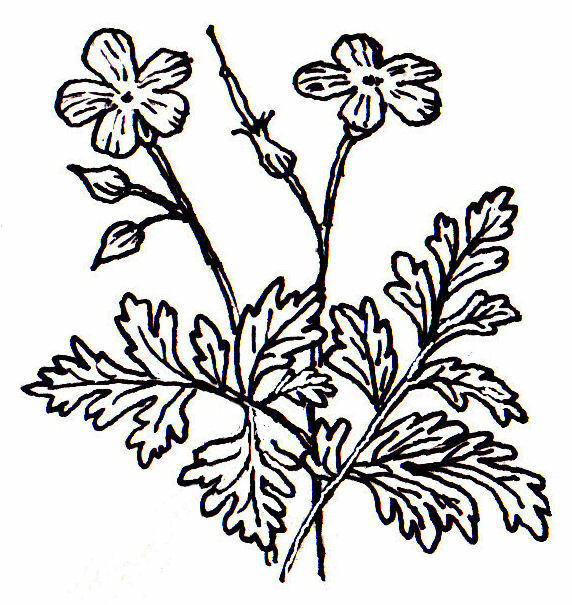 Other names : Arb Rabbits, Baby’s Pinafore, Bloodwort, Cranesbill, Cry Baby, Cuckoo’s Eye, Death-come-quickly, Doll’s Shoes, Dolly’s Apron, Dolly’s Nightcap, Dolly’s Pinafore, Dragon’s Blood, Drunkards, Felonwort, Fox Geranium, Gipsies, Gipsy Flower, Gipsy’s Parsley, Goose Bill, Granny’s Needles, Granny’s Nightcap, Granny Thread the Needle, Headaches, Hen and Chickens, Hop o’ My Thumb, Jack Horner, Jam Tarts, Jenny Flower, Jenny Hood, Jenny Wren, Joe Stanley, John Hood, Kiss Me, Kiss Me Love at the Garden Gate, Kiss Me Quick, Knives and Forks, Lady Janes, Little Jack, Little Jan, Little Robin, Mary Janes, Red Robin, Wren Flower.